faerie tale feet painting inspired by tinker bell from j.m. barrie's peter pan. i credit my dad with my obsession with peter pan. of course i grew up watching (repeatedly) the classic disney animated version. and “peter pan’s flight” is still my favorite ride in all of the disney parks. i didn’t read the book until i worked in a book store during college. and it didn’t quite resonate with me. but i’d say in the past five years, i’ve probably read it another ten times. i guess i get it now. barrie’s adventurous island. the darlings’ daring escape into the night. peter’s forgetfulness. the lovely mermaids. brave tiger lily. the ridiculous pirates. but perhaps i’m mixing what i grew up with into barrie’s marvelous prose. before i even saw the disney film, i saw mary martin’s broadway performance in the cbs (re-)telecast. (hook’s tarantella is just one of those things that sticks with you. and mary-as-peter outsmarting him in the woods as that “mysterious lady.”) i got to see the traveling show live with cathy rigby (can i watch the lost boys and the indians drum on the stage forever, please?!) and i absolutely fell in love with p.j. hogan’s non-musical, very colorful, film version in 2007. it’s in my top ten favorite movies ever. all that to say, the story, just like peter, doesn’t get old. 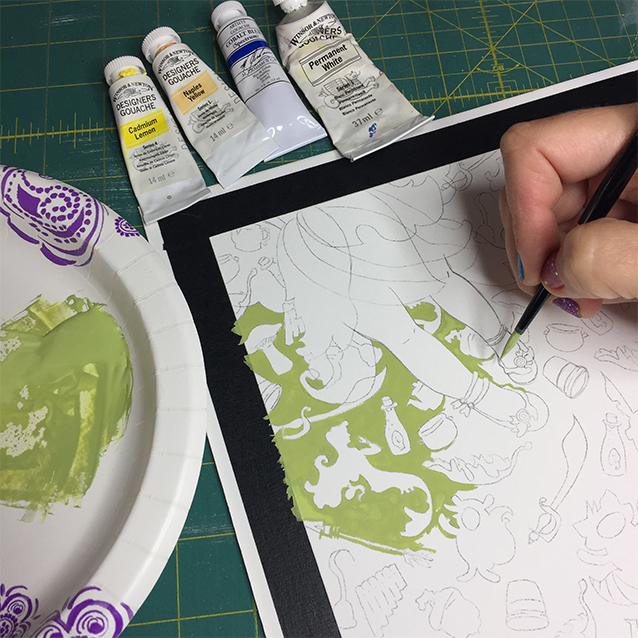 so behold: my process and iconography for “i do believe in fairies,” my faerie tale feet gouache painting ode to tinker bell. see my process below, and then further down i’ll tell you everything from the original story hidden in the background! here’s the final pattern drawing taped down to my illustration board. i’ll put a piece of transfer paper between the tracing paper and the board, and re-trace every line so that i can have the drawing on the board and paint around all the shapes. once the drawing is transferred, i’ll mix up my main background color (obsessed with what my instagram followers & i dubbed “morning moss”) and paint around each and every shape- it usually takes upwards of 5 hours and i have to do it in one sitting to keep the paint colour & smooth texture consistent. for whatever reason, but probably so i can make them stand out as needed depending on how the rest of the piece turned out, i always paint the legs/feet/shoes of our main character as the very last thing. so here are all the different shades of green i mixed for the background on my trusty paper plates, and the finished nursery/stage at the bottom. here’s a zoomed-in shot of that nursery window with our london skyline and the second star to the right beckoning our adventurers on to more fantastical things. tinker bell first appears in the stage production (it was a play to begin with, of course, then due to its tremendous theatrical success, barrie was “forced” to turn it into a readable novel; i’ve read the stage and prose versions multiple times, naturally) as a ball of light, flickering about the stage, looking in lamps and drawers for peter’s shadow that nana, the nurse dog, caught when peter had made an earlier visit to the darling family’s nursery window. in light of this (theatre pun! ), i wanted to weight the painting with a facsimile of the nursery set that opens the stage production. so we see the beds of wendy, michael, & john, complete with the nightlights hanging by each of their beds (“the eyes a mother leaves behind for her children.”) i also snuck in a teeny tiny pirate ship by the boys’ beds as they were ever so fond of playing pirates, even if forever bickering of who would play villainous captain jas. hook. nana’s doghouse is in the nursery, too, and i mimicked the london skyline that is seen in wendy‘s painting. second star to the right (& straight on ’til morning; famous directions, although peter makes it up on the spot)* shining brightly as ever. fun fact: i intended to paint peter’s shadow on the nursery walls as it appears in the disney ride, but i obviously forgot. i do hope you get the idea of our little minx and her jealous, protective self, even without peter’s lingering presence. there were lots of other shapes i’d wished to fit in there to tell the tale, but i hope you’ll read the play. read the book. see the musical. see the movie. see the animated film. relish in the unending adventures of neverland and the boy who refused to grow up. and his fairy. collect "i do believe in fairies!" 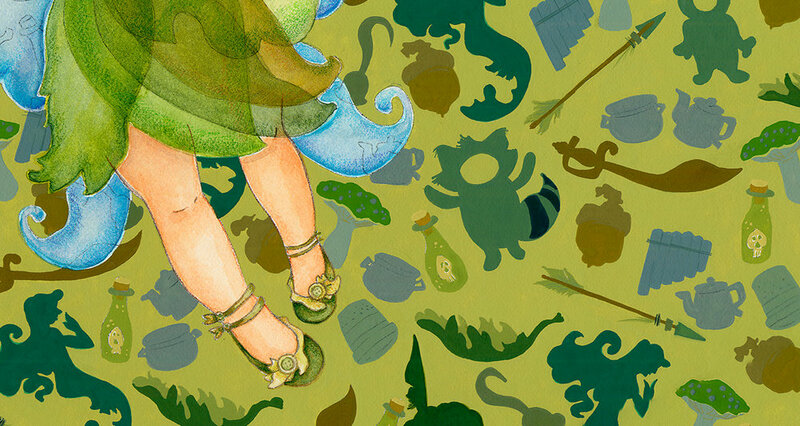 limited edition signed tinker bell prints HERE. & her matching greeting cards are available HERE. front of blank faerie tale feet card reads: "you don't mean to tell me that there is a fairy in this room!" ***embonpoint: excessive plumpness, stoutness. as she should be.